Having worked in and with social media for a number of years now, I can shamelessly say that I love Instagram. While each platform serves a different purpose and not all of them are right for every business, there’s nothing quite as versatile as the rabbit hole that is Instagram (except for maybe YouTube). Again, I’m not discrediting the usefulness of any other social platform here, but let us count the ways of what makes Instagram so great, and how it can help your marketing efforts. As of January, Instagram is boasting an impressive 800 million users. While this pales in comparison to Facebook (2.2 billion) and YouTube (1.5 billion), 60% of its users check the platform at least once a day, and 63% of them claim to use the platform several times a day. What’s more impressive, is that 59% of Instagram’s active users are between the ages of 18-29, and an estimated 76% of US Teens (ages 13-17) use the platform – making it one of the most popular platforms for Gen Z and Millennials, who are about to be a purchasing force that you can’t ignore. We all know that Instagram is a place where users share pictures and videos, but users don’t just care about what their friends are posting, 80% of users follow at least one brand. And with the introduction to add shopping buttons to content, the platform is ripe for brands to share news about products and easily allow their fans to quickly purchase new and old products without ever leaving the app. A couple of years ago, Instagram blatantly stole stories from rival platform Snapchat. At the time the move was roasted pretty heavily by users across the web. I even remember talking with a friend who also worked in social media marketing and joking said that I only ever look at Instagram stories when I’ve run out of things to look at on every other platform. That’s no longer the case today though. 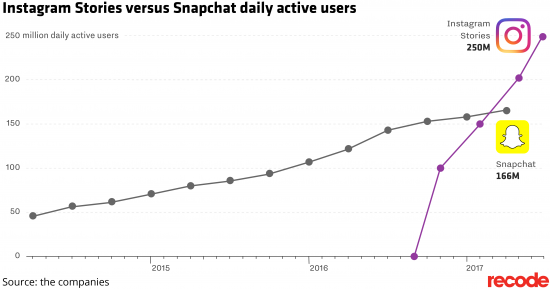 Within the first year of their launch, an average 250 million users are posting Instagram Stories every day, versus 166 million Snapchat stories, and a reported 1/5 organic stories result in a direct message. Speaking of organic content, one of my favorite features when it comes to Instagram: Hashtags. I’m a skateboarder and sneakerhead. There are shoes that my friends and I skated in over 15 years ago that are worth over $2,500 today. You may be asking yourself where I’m going with this. 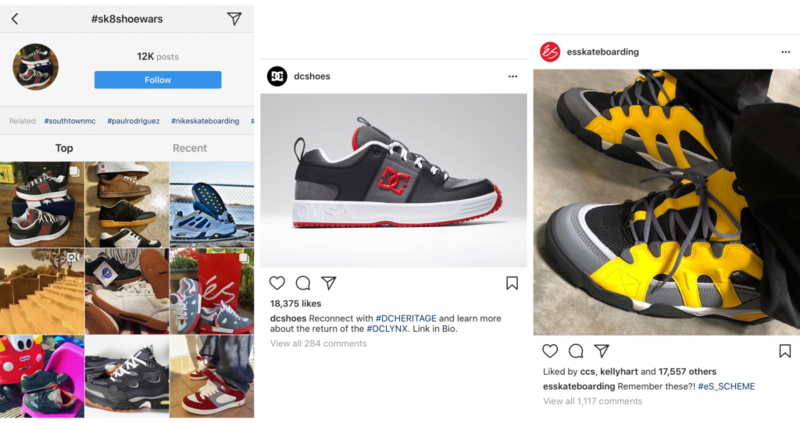 But hashtags like #sk8shoewars have not only allowed me – as a user – to take a trip down memory lane, but they’ve also provided brands within the skate industry a platform to listen, interact and release products that consumers are yearning for. This isn’t just related the skateboarding and sneaker industries either. If you have a hobby or business, start searching for relevent hashtags. Influencer marketing is so hot right now. In fact, going into 2018, 39% of marketers planned to increase their influencer marketing budgets. While the ROI for influencers is still a little hard to determine, consumers (especially Gen Z and Millennials) say they’re more likely to buy a product if it’s recommended to them from an influencer that they trust. And while influencers are on just about every social program, Instagram reigns supreme for both marketers and the influencers themselves alike. This is because it’s the most effective for engaging with audiences. As I mentioned earlier, Instagram isn’t right for every brand, but it’s one of the most important social platforms for marketing and one of the most fun for users. If you have quality visual content, what are you waiting for? Get it on the Gram! If you need any help with your social media strategy for any channel, contact Anvil today!